…fermentation problems do come up now and then. So today we're all about troubleshooting ferments. Whether it's not bubbling, it's mushy, or you plain and simple just don't like it. I've got the answers for you here. Hey everyone, welcome to Know Your Food With Wardee! This is episode 172. I'm so glad you're joining me. Hello to the live audience that's joining me right now on Facebook Live. You guys are great because you're here live. It really gives me great feedback and great energy to know that I'm talking to real people present right now. Not to put down anybody who's coming in later, 'cause you are wonderful as well. So if you are tuning in later, not live through your earbuds, you can switch over to the video version at the show notes which is knowyourfoodpodcast.com/172 or vice-versa. And the other thing that's waiting for you at the show notes is the complete recap in print of everything I'm planning to share today. 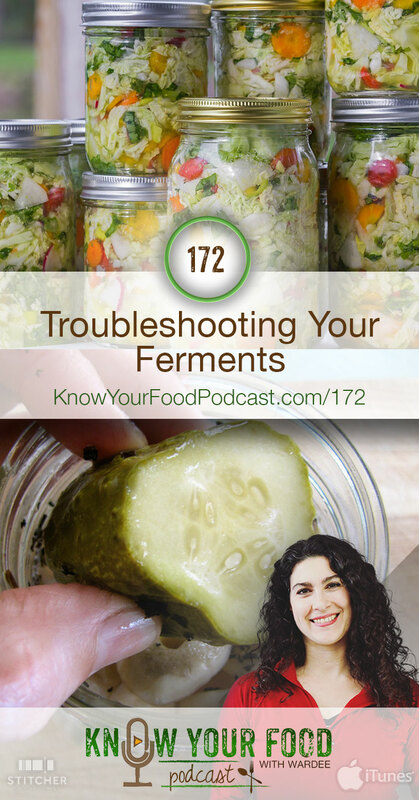 We have a great topic today — troubleshooting your ferments. It is the gardening season and so many of us are putting up the bounty that we are harvesting either from the farmer's market, from friend's gardens or our own gardens. And we want to ferment and sometimes things go wrong, so today we're all about troubleshooting your ferments. So let's get into it. First I want talk about fermentation to make sure we're all on the same page and everybody understands what we're talking about. Most of us probably think about fermentation in terms of like, vegetables, like sauerkraut or pickles. But you can ferment virtually anything. Anyway, you are taking those vegetables and you're taking salt and you're combining them and giving them a few days to a few weeks at room temperature to do a marvelous process. The naturally present organisms on those fruits and vegetables will begin to feast on the starches and sugars in the foods. And as they do that, they will multiply, which means produce more of themselves. They'll also produce enzymes, vitamins, beneficial acids, even gases, that's where you get bubblyness in your ferments. And the result of all of this is that the food is naturally preserved because the benefits of the beneficial organisms has exploded to a huge population that repels spoiling organisms. Also the beneficial acids in the salt will repel spoiling organisms, so you have a naturally preserved food with hardly any work. You also have an incredibly healthy and delicious food to eat that is rich with enzymes, vitamins, probiotics. I often say that fruits and vegetables are wonderful but if you ferment them, you make them better. I should've mentioned, I am the author of The Complete Idiot's Guide to Fermenting Foods. You may or may not have my book. But it's been a couple years now that it's been out and it's been a lifetime that I've had enjoying and learning to make homemade cultured food so I'm just thrilled to be able to talk about it with you. So that's the process of fermentation and even though it's safe, you can do it at home, you don't need really special equipment, and it's been done since the beginning of time, issues do come up now and then. But I don't want anybody to be scared about it — the things that I bring up today. I want to cover some basic safety that has to do with fermentation. These are things that you want do no matter what you're doing, it doesn't have to do just with fermentation. You should practice cleanliness with all your cooking — keeping your containers and your utensils clean, keeping your counter tops clean. Also, using organic produce so pesticides and such don't mess with the natural processes. Use a good quality salt. I like Redmond's Real Salt. It's an unrefined salt that has lots of color which mean you know it hasn't been bleached, it hasn't been fortified with chemicals or anything. A good salt. Ferments love salt, by the way, and they love unrefined salts because those organisms flourish in those minerals. You want good water for your brines that you're creating to put over your vegetables. Your water shouldn't be chlorinated or fluoridated so if you are on city water you would want to purchase spring water or filter your water. Wash your hands, so all of this is basic sanitation plus just basic, wholesome ingredients and that's really, really important not only for fermentation but all cooking. So shouldn't be a surprise to anyone that we're talking about these basic things. So if that doesn't give you confidence, then I'm not sure what will. It is true that we have been fermenting food since the beginning of time. From every culture in the world doing their versions of bread, their versions of sauerkraut, their versions of cheese, fermentation was discovered pretty much when civilization started as a fantastic way to preserve foods. Also, it made people feel good and kept them healthy. So it's been around a long time. So hopefully no one is scared going into this even though we are going to be talking about trouble-shooting your ferments. Okay, so let's go through these potential issues with fermenting. Well, here's the thing. You get varying degrees of bubbling when you're fermenting. Remember I told you the process of fermentation, the organisms are feasting on the sugars and starches and food and one of the things they produce is gas. They're respirating and so that makes your ferments bubbly but not all ferments bubble the same amount. So if you're making sauerkraut and it's bubbling like crazy, I call that a happy ferment. Pickles may bubble a ton. Other foods don't bubble so much, so if it doesn't bubble so much that doesn't mean it's bad, it just could have to do with the food. And on the screen you see that 5-spice apple chutney, that is a thick mixture. Or if you're fermenting a ketchup or a fruit paste, those are thick mixture. They don't tend to bubble as much. So don't just toss out the ferment that doesn't bubble, even if it's a sauerkraut and it's not bubbling as much as the last batch. It’s not a reason for concern. You want to take it in context with everything else and all the other signs of a good ferment. Not bubbling is not a reason to toss it. All right, let's go on to number 2. I just put on the screen a mixed vegetable kraut that I have inside Traditional Cooking School in the Dairy-Free Ferments lesson of our Allergy-Free Cooking eCourse. I used a vegetable starter rather than whey to boost that ferment, so that's what the picture is. So number 2, though, is it smells off. People will say, “I open it, it just doesn't smell right. What's wrong with it, is it okay? It smells like…” And then, you know, insert whatever it smells like. The first thing I want to say with this one is make sure not to confuse the normal smells of fermentation — which are sour and acidic and maybe a little bit yeasty — with spoiling. Just because it smells different to us doesn't mean it's spoiling. So don't assume automatically that if it doesn't smell right then it's bad, okay? It could be, but just don't confuse the smells of fermentation which can be sour and to some people, can be off-putting, with spoiling. Spoiling smells rotten, spoiling smells despicable and disgusting. Now I know some people who've never had a ferment in their life may smell sauerkraut for the very first time and say that it's disgusting. Well, I'm not talking to you, I'm talking to people who have had sauerkraut and sour foods and whatnot. Don't confuse those smells with spoiling, 'cause spoiling is disgusting, it is repulsive, you just know it's rotting and needs to go on the compost heap. Another thing to do when you are assessing your ferment — I encourage you to open it, see how it's doing. Get hands-on with your ferment. Some people ferment for five to seven days, some people ferment it for a couple weeks, well whatever the time period is, it's not that you can't touch it for that time. Assess how it's changing in texture, smell it, taste it, get to know the ferment. The more hands-on you are, and I'm not talking about hands-on all the time, but the more you interact with it, the more you learn and the more informs you on future ferments. The reason I bring this up is because as you're hands-on with your ferment, you know, maybe opening it up daily to check on how it's doing, you're going to open up your jar, or whatnot, and the very first air that puh, pops out, is not gonna be the most pleasant smelling smell. Don't go by that to assess the smell of your ferment. Open it, let that first puff of air disperse, and then smell what's inside the jar. Because then the smell is accurate to how the ferment is going, okay? Needed to get those 2 things out of the way. But then let's say it does smell off. It smells excessively yeasty, it smells alcoholic, it smells maybe a little bit metallic or it smells like paint thinner. I've heard that before. People say it smells like paint thinner. Well, you want to look at your conditions. Remember I talked about safety and cleanliness? One of those issues, besides your clean containers and fresh vegetables that you washed and you want the organic vegetables so the pesticides don't mess it up… Besides all those things, you also want to look at the temperature. Most of the fermentation we're doing should be done at room temperature. That's about 72 degrees Fahrenheit. Well if you're getting into the high 70s, 80s, 90s, then it's getting way to warm and that is where your ferment can go bad. Can go bad in smell, can go bad in other issues that I'm gonna talk up in a bit. So if you feel that it's smelling off, it very well could be the temperature. And if you feel that it's smelling metallic or alcoholic, or like paint thinner, this is the number 1 cause is that it's fermenting too warm. You don't want it to be too warm, so move to a cooler location. Use your air conditioning. It gets challenging in the summer, gets challenging for me too. We don't have air conditioning, so you know, very very hot days, there's no way I'm gonna be doing a batch of pickles because I know they're not gonna turn out very well if it's too hot. Okay, so that's the issue number 2, smells off. Issue number 3. This is one of my favorite things to ferment (pictured). Starting with growing our own or acquiring very good pickling cucumbers and making our own pickles. These are so much better than any pickles you could buy. When they really work they're crunchy, salty, sour, oh they're so good. That leads me into the 3rd issue here. Mushy. Nobody wants to end up with mushy pickles or mushy sauerkraut. Nobody likes that. Well this can be caused by… One of things in fermentation that we often use is a starter culture. When we talk about starter culture, we mean adding organisms to the ferment to get it off to a good start. So there's veggie starter cultures, you can drip off whey from plain yogurt, or plain kefir with active cultures. Anyway, these starter cultures you can use to boost your ferment but I have found, often, that using whey with sauerkraut, for instance, can lead to a mushier, maybe even slimy ferment. So if it's vegetables I would encourage you not to use a starter culture at all. Or don't use whey, use a veggie starter culture like Body Ecology has one, Caldwells is another brand, homesteadersupply.com, which is one of my favorite online merchants and suppliers of things that homesteaders like us want. They have a great veggie starter culture and these tend to help you end up with a crisp result rather than a mushy result. So if you're getting mushy, and you're using whey, maybe make it without whey next time. Whey doesn't always lead to mushy, so I want make sure everybody knows that but it can sometimes. What else? Maybe you didn't use enough salt? Salt is really key for crunchiness, so increase the salt. Also, maybe too much oxygen, so if you're fermenting in jars where the air is getting in and out, that can lead to mushiness. You'd want to instead look at either crocks that you can completely seal up or modifying your canning jars with an airlock lid. In fact, I'll bring up homesteadersupply.com again, they have a lid called a Pickle Pro and it's a modified Tatler canning lid that an airlock has been added. It fits right on your regular or wide-mouth canning jars. I do prefer the wide-mouth. It's not completely air tight, but this air lock can be, I'm not gonna put a percentage on it, but it can really make a big difference on using a, like, a plastic lid for your mason jars or it can make a big difference on using the metal lid with the ring. So you could look into that. You could also use a Fido jar, those are completely air-tight or you can buy some of the completely air-tight fermentation vessels. So, oxygen, too much oxygen getting in could lead to mushiness. Another thing that I encourage people to do, this goes back to the hands-on aspect, when you're making your sauerkraut or any kind of mixture of vegetables. Remember I talked about how when the fermenting organisms, they consume the starches and sugars and food, they respirate which means they produce gasses, and so that gas can actually create the mixture, like bubble up and make the mixture just lift up in the jar over time. So then you have all these air pockets. Well, the air pockets can lead to mushiness. So be hands-on, open your jar every day. If it's a really happy ferment and it's bubbling up, open it up and press that stuff back down under the brine. That will help you not get a mushy end result. All right, we're on to the next one and that is mold. Now, the sauerkraut on the screen is not moldy, it's just another pretty picture. By the way, I do have a wonderful sauerkraut recipe at traditionalcookingschool.com. You can go there and you can use the search and you can search for “no pound kraut”. It's a basic, wonderful recipe for sauerkraut that works nearly every time. It's the right amount of salt and you don't have to pound for hours, you use the salt to help pull the water out of the cabbage and it creates its own brine without a lot of work. That's why it's called no pound kraut. So search for that at traditionalcookingschool.com. All right, occasionally we get mold on our ferments. It could be little patches of mold, it could be a thin layer of mold, it could be mold that's got tendrils throughout your ferment. It's sad in all of those cases but not all of them are fatal. Now I don't want you to confuse mold with a white greyish yeast growth called kahm, K-A-H-M. Kahm is like dusty on top and it's not harmful, but it can cause off-flavors and it's really too much oxygen. What I'm talking about here is mold. Mold is like grey or pink or fuzzy. It's not like a flat dust, it's fuzzy. So little patches of mold just skim off. Then look into your conditions, if it's too much air, if it's too warm, not salty enough, if there's not enough brine in your jar. You can correct all of those. If your mixture is coming to the top, press it down, you may need to weight it down. There's fantastic glass fermentation weights. I've purchased a couple sets off eBay, I really don't know if they're still on eBay but you could Google for glass fermentation weights or glass fermenting weights. That can help keep your mixture completely under the brine so that nothing's at the top getting exposed to air and growing mold. If you have a thin layer of mold at the top, that also can be skimmed away. Then you want to address any issues like the ones I mentioned before, correct them, and continue to fermentation. If you have mold tendrils going throughout your ferment, you may not be able to see them but you can test it by skimming away off the top, letting any air dissipate and then taste or gently smell what's left. Not a huge amount but just enough to assess if the rest has been overtaken. You can taste it and in that case you would want to discard and start over again and look at everything from the cleanliness to the containers to the amount of oxygen to the vegetables you're using to the air temperature and all that to hopefully have a better result the next time. Alright, we have 2 more points to cover. This one is, you don't like the flavor. So the others that I've mentioned more have to do with things you can fix and this one you can fix, too, but some of it is taste. I want to start by saying that in our society most of us come to ferments late in life and we may have addictions and/or tastes that are just really set in stone. Learning to like ferments can be a transition, a process, it has to be, it's what you would call an acquired taste. So give yourself time. If you don't like it the first time, that's okay; don't assume you're never gonna like it. Try again in a week or two. Adults can be like children too, where they don't like it from the 1st time they tried it to the 11th time, and then the 12th time they'll say “I'll try some more” or “I like this”. Sometimes adults are more that way because we're older and our habits are more set in stone. So give yourself time. There is something you can do about the taste, though. You may be tasting a ferment that is just done. Like, it just finished fermenting and you just chilled it for a while and you're tasting it. Well if you move your ferments like your pickles or your sauerkrauts or whatnot to cold storage — which is the fridge or cellar, which is what you do when it's done with the fermentation stage — the activity of the organisms slows way way down. It's cold but it doesn't stop and that ferment will continue to age. Often, aging leads to mellowed out flavors. A different complexity, even less saltiness. You might even find, like many of us, that you begin to crave ferments. I know I do. I have to have some sauerkraut every day and I will scoop it out of the jar and then it's just like my body is saying “Give me more of that.” And I'll scoop some more and I'll scoop some more and pretty much I have as much sauerkraut as I would have a small salad. So we go through it a lot. Anyway, if you don't like the flavor, number 1, give yourself time. Number 2, give it a chance to mellow and there is hope for you yet. All right, our final trouble-shooting step here is too dry, my ferment is too dry. This is what happens. You make your sauerkraut, it could be very happy and actually the liquid is spilling out all over the counter. I actually advise in many of my recipes to put your ferment on the counter on a towel so it doesn't make a big mess. You can swap out the towel, it absorbs that liquid. So that's some liquid loss and it may not be detrimental during the ferment but then you move it to the fridge and all that bubbling and activity that was happening at room temperature slows way, way down with cold storage. All the contents of the jar just sink including the liquid, the brine, and then you open it and you find that, like, the top inch or 2 inches of your sauerkraut is dry. It's not submerged in liquid anymore. Well, you shouldn't store your sauerkraut that way. You want it to be under the cover of brine even in storage, so the solution is, you may have an old batch of sauerkraut. You've eaten all the cabbage but there's some juice left. Oh, by the way, don't discard that juice, 'cause you can use it as a starter culture to start other ferments, you can drink it, you can add it to salad dressings. It's delicious, but one thing you can also do with it is you can pour it into the new ferment to top it off so that everything is submerged. If you don't have any brine from a previous ferment you can make some new brine. You just put some salt in water and, what I usually do, I eyeball it, is like a teaspoon of salt and like a cup of water and I stir 'til the salt is dissolved and that's what I'll use to top off ferments that have gone dry. Okay? So I think we covered it. We've gone over doesn't bubble, we've gone over it smells off, we've gone over mushy, we've gone over moldy, we've gone over you don't like the flavor and we've gone over it's too dry. So those are the major issues that come up again and again when people email or correspond with me about fermenting. I hope that I've assured you that fermenting is safe and that there's simple things you can do about these issues. Some of them are really not a big deal anyway. Above all, I just hope that you really get into fermenting and succeed and enjoy the flavors and the fun. It's just a wonderful, beautiful process. To me, it shows me more about God's creation and this beautiful process that he gave us to preserve food and make it very, very healthy for us. Like sauerkraut is one of the most healing foods you could eat. So if you're really excited about fermentation, I want to make sure you know about a free gift I have for you and that is a fermenting formulas cheat sheet. You can pick it up at tradcookschool.com/fermentsheet. It's a completely free quick guide where I go through formulas for fermenting. So what I do is if you want to make a quart of sauerkraut, a quart of pickles, a quart of relish, a quart of salsa, I give you, you know, you need this many vegetables, this much salt, this much brine, basically I give you the formula so it'll allow you to take that garden harvest and create ferments because you know the formula. You're not going off a recipe that has this much of this, this much of this, this much and this, you actually have a formula. I personally find formulas so much more helpful than recipes because then I know that I can adapt and make it work within my kitchen. So I've gone through and created these formulas for you to help you create delicious, healthy and safe ferments. There's also some basic guidelines for fermenting so that you have good information to refer to on what the process is and the basics that you need in order to make it happen. So again, that's at tradcookschool.com/fermentsheet. All right, well, unfortunately I haven't been able to see any comments here on Facebook Live, I don't know how to actually make that work on my phone. Hopefully I'll figure that out for next time. I want to thank you all for joining me live and those of you that are coming in later, listening to this, you can visit the show notes, knowyourfoodpodcast.com/172 for all the information that I've presented here in print plus there's an audio version and a video version so you can switch around. Thanks for joining me, everyone! God bless you. 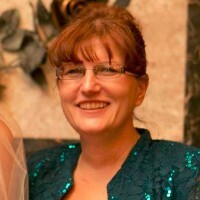 Hi Wardee and Team. When you made that additional 1 spoon salt in a cup of water, must the water be boiled, hot, warm or cold? I have a 5 Lt jar that I made a concoction of cabbage, carrots, green & yellow peppers, onions, cucumber and Jalapeno Peppers with some Peppadew Peppers as well. I added some mustard seeds and Pickling Spices. My question: Is it ok that I am just adding more veggies to the bottle as I remove and eat the contents or should I boil up extra liquid. There is a lot of liquid, white vinegar, in the bottle and the veggies come to the surface as there is more liquid than veggies. For the additional brine, to top off, the water doesn’t need to be boiled (unless that is your usual practice to clean water). It should be cold or room temp when combining with the salt. Is your concoction fermented or vinegar-pickled? If it’s vinegar-pickled, we really don’t know as we’re not familiar with that method. If it’s fermented, yes, you can keep adding additional veggies to the jar and they will ferment too. (Though more slowly if it’s in the fridge.) Add more brine as needed so everything stays covered. My problem concerns the odor of the utensils (glass jars, lids) after consuming all of a given batch of ferment and then cleaning them as thoroughly as I can. they are stored. It got so bad that my fermenting experiment was banned from the kitchen. You could boil the utensils for 2 minutes or try cleaning with vinegar or baking soda. I will try that… I did put them in the dishwasher which did not make the odor disappear. In this video it is mentioned that if your liquid settles when storing you can use saved brine from an older batch of sauerkraut. Earlier when discussing pickles and kraut it is mentioned to help keep them crunchy using a veggie starter culture rather than whey. So my question is could I use older brine as a veggie starter culture? I just made some kimchi (salt brine, no whey) and it tastes and smells great. This time around, though, the veggies are a bit soft. Not slimy or extremely mushy, but not crispy like last time. Is there any reason it would be unsafe to eat? I’m going to make more (I’ve made it a dozen times and it’s always had a crunchy texture), but I hate to waste what we already have. Thanks!! Thank you so much Wardee! I am so glad I discovered you! I am new to fermenting did my first sauerkraut and while fermenting I didn’t cover it with a lid and the fermenting is going slow it’s been 8 days should I cover it with a tight lid and let it ferment for couple more days or toss it? I missed that I have to cover it with a tight lid, it doesn’t smell bad and crunchy but not sizzling. I really like the one I get from Trader Joes it’s sizzling and it doesn’t make my stomach achy. I made a basic cabbage ferment for sauerkraut, cabbage and pink salt, which I’ve done before. I have a gallon sized airlock jar that I packed it in after getting a good amount of brine from the cabbage. about 24 hrs after I closed the jar the brine overflowed. Ive never had this happen before. usually I can barely get enough to cover the cabbage, but this time the level kept rising in the jar. Is it just because of the water content of the cabbage I started with? It may have been cabbage with more water. Also, during summer months (warm weather) ferments can happen much faster and be more aggressive. The combination of both can cause an overflow problem. I found this on makesauerkraut.com about salt ratio slowing, speeding up or making the ferment slimy. 3 tablespoons of salt for 5 pounds (2400 grams, 2.4 kilogram) of cabbage and vegetables. Too little salt speeds up the fermentation and might produce soft or slimy kraut. Adding too much salt slows down the fermentation and will inhibit the growth of the lactic acid bacteria, just the bacteria you want.